While the term minnow commonly refers to small, silvery fishes, it is actually the largest and most ecologically diverse family of fishes found in United States and North America. Between 230 and 290 of the 2,100 or so minnow species live in North America. These freshwater fish prefer a wide range of habitats throughout their ranges. While most North American species are small, reaching about 4 inches long, some species are large. The introduced grass carp, for example, can reach 20 pounds. The largest minnows can be around 9 feet long and weigh up to 100 pounds. Carp are also minnows. Common fishes in the minnow family include chubs, shiners and dace. Habitats for these often small fish vary as much as the number of species. Most live in clean, fresh streams; but they'll also inhabit swamps, bogs, headwaters, lakes, rivers and ponds. Some can live in brackish waters. Cool and warm environments both are inviting to various species of minnows. Their adaptability is partially due to their willingness to eat several different foods. 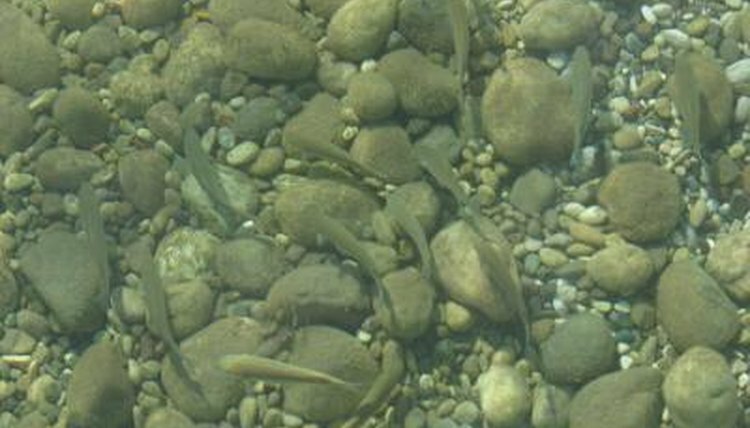 Minnows are most abundant in clear waters such as streams. They'll hide among the rocks and plant life to avoid predators while scoring food. In murkier waters, minnows use dirt and debris to help hide themselves from predators. In both types, you may find several different species living in the same conditions in a single body of water. As long as plants and smaller animals to prey on exist, typically a minnow species -- or several -- will thrive. The availability of food plays a great role in habitat choices for minnow species. Most species are omnivores who eat primarily herbaceous materials; some are strictly carnivorous. The omnivores eat a wide variety of fresh plant life in the water, while carnivores stick to hunting arthropod prey and smaller aquatic life. Their feeding preferences dictate where they spend most of their time. Minnows are high in ecological importance because they are a great food source for other fish, birds and species that engage in eating fish. Minnows are widely used in the bait industry. In an interesting twist on behavior, minnows become more and more nocturnal as the water temperature decreases in their habitat. It's believed to be an evolutionary adaptation: The minnows become more nocturnal to avoid the diurnal predators that become less active during different times of the day.